The library type string consists of three parts: the relative orientation of the reads, the strandedness of the library, and the directionality of the reads. So, for example, if you wanted to specify a fragment library of strand-specific paired-end reads, oriented toward each other, where read 1 comes from the forward strand and read 2 comes from the reverse strand, you would specify -l ISF on the command line. This designates that the library being processed has the type “ISF” meaning, Inward (the relative orientation), Stranted (the protocol is strand-specific), Forward (read 1 comes from the forward strand). The single end library strings are a bit simpler than their pair-end counter parts, since there is no relative orientation of which to speak. 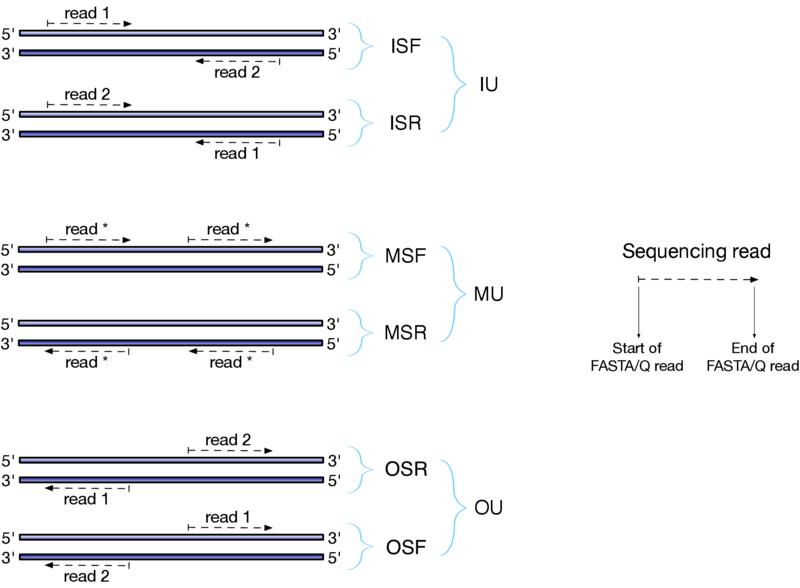 Thus, the only possible library format types for single-end reads are U (for unstranded), SF (for strand-specific reads coming from the forward strand) and SR (for strand-specific reads coming from the reverse strand). The remaining salmon library format strings are not directly expressible in terms of the TopHat library types, and so there is no direct mapping for them.